Now that the holidays are over and the cards have gone out, I wanted to show you what I did in November. 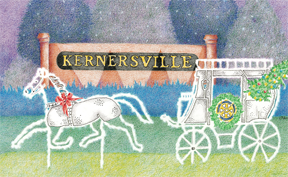 This was the artwork for the Town of Kernersville Christmas card this year. Thank you TOK!!! Those of you from around here will recognize the entrance to the town on Main Street and Cherry Street. This was a challenge for several reasons. First, it was a fairly short deadline. I think it was less than three weeks including a sketch for approval. The horse and carriage are white metal that have white lights around the edges at night. All these years of drawing and painting and this was the first night scene I’ve done. I didn’t want it to be just a black background either so I had to work on some color that would still make sense. When I went out after dark to photograph the entrance for reference I discovered something else. The Kernersville sign is NOT illuminated at night! Heck, I always thought it was! I also had to do some “landscaping” to raise the sign above the horse and carriage. I put that “Creative License” they gave me in college to use. This was a fun assignment and I appreciate the opportunity to do it. Yes, Town of Kernersville, I would love to do another one if you would like me to.